Having a profitable project is essential to a successful business. This months webinar will focus on helping you make sure that your project is always profitable. The WP Elevation team are back again at the end of the month, with a one hour free webinar that will help you bring in enough money every month. For those of you who missed the last webinar on how to launch and hand over a website to your clients, make sure you catch up and get all of the useful downloadable materials. This month we will focus on helping you to avoid working all hours, taking on more projects, but not making more money. It’s important to remember that it’s not the customers, or the marketplace that determine whether you are profitable or not. It’s on you. Often websites can be challenging to price, because there are so many elements at play, but there is a set of simple rules that if you follow can guarantee you that every project you work on is profitable. 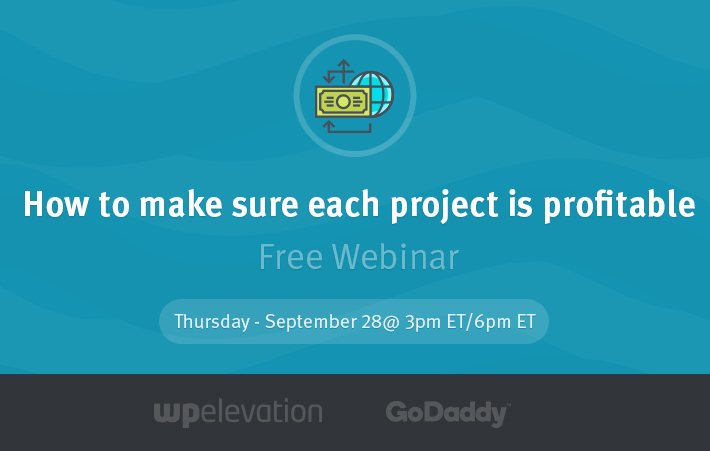 Join GoDaddy Pro and WP Elevation on Thursday, September 28th at 3pm PT/ 6pm ET for a free one hour training session. Each month you are joined by knowledgable and friendly WP Elevation hosts, this month you will be learning from Troy Dean and Mike Killen. Troy helps WordPress consultants build successful businesses through webinars, coaching, speaking, consulting and heading up the awesome community at WP Elevation. Mike is the owner of Sell Your Service, and he works with funnel builders to help them sell marketing funnels and run a funnel business. The time on your webinars are always inconvenient for me, do you keep a video of them for later viewing? Yes you can sign up and download the video afterwards. I tried to sign up, but the registration page is giving an error. ( “Error establishing a database connection”). Can you have a look at this. I just tried it and it worked for me. I will ping the guys over at GoDaddy to make sure it’s all working. Try for me one more time when you get a chance and let me know if you still don’t manage.